Do you remember ALESTORM celebrating their live show at RockFels 2017? 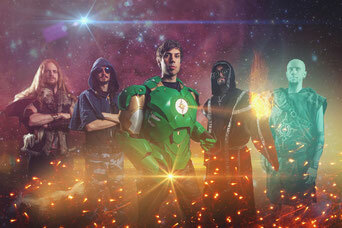 The same guy, the Scottish Christopher Bowes, returns to RockFels 2018 with his second band GLORYHAMMER - a fantastic musical journey through a heavy metal fantasy story! The singer Thomas Winkler leads on the first album "Tales from the Kingdom of Fife" through the massive chapters of their musical legend while the instrumental section delivers the virtuosic melody foundations. Their most recent long player is called "Space 1992: Rise of the Chaos Wizards" and continues the story of the first album - helming a 2000 year time jump to the future. An unbelievable live event that you better not miss!